Every miracle reveals some larger truth. Miracles of healing show us that God made us for joy, not misery. The Virgin’s pregnancy reveals that every child is God’s work even more than the work of the parents. A long-dead saint’s dried blood runs liquid to show us that he lives now in heaven. 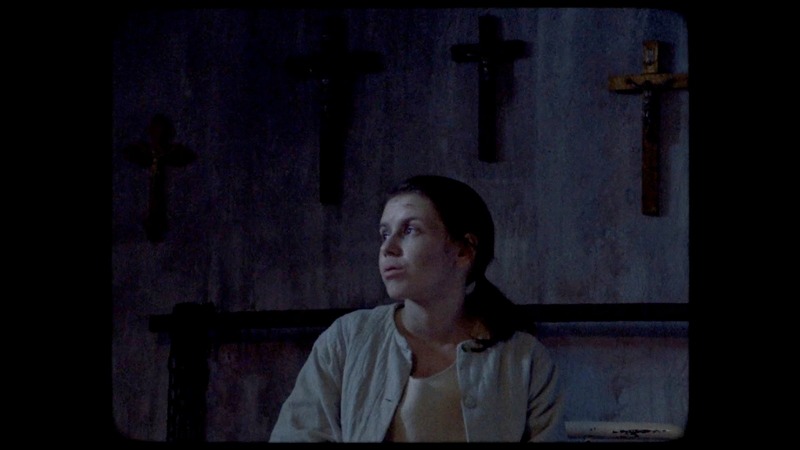 “The Devil’s Doorway” is a found-footage film set in 1960 in a Magdalene laundry. These laundries were workhouses, initially set up for prostitutes, but were later used to indefinitely incarcerate women considered immoral for a variety of reasons, including unwed motherhood. Two priests come to the institution to investigate an anonymous letter claiming that a statue of Mary there weeps blood and that the nun in charge of the reformatory is covering up this miracle. Their investigation uncovers horrific physical cruelty, hidden graves, an underground prison and—as the title promises—the Devil himself. In spite of its flaws, the film is startlingly successful both at frightening audiences and at honoring the experiences of women held in Magdalene laundries. What is so awful about a place like this one is its institutional power, its inescapable control of every vista, the sheer weight it brings to bear on the girls caught within it. And she unloads a furious speech on them, in which she says that the Catholic Church wants to “sweep it all under the carpet and leave all the dirty work to the women!” This would seem like a feminist critique if it were not voiced by the head of an institution where women are abused. “The Devil’s Doorway” won’t offer viewers a lovable hero or a set-piece speech to cheer. The investigation phase is not quite satisfying to watch. The found-footage conceit makes it impossible to form a coherent mental picture of the reformatory as a whole—we get fragments of hallways and glimpses of rooms, rather than the overwhelming institutional menace of a film like “Session 9.” What is so awful about a place like this one is its institutional power, its inescapable control of every vista, the sheer weight it brings to bear on the girls caught within it. The film has several of these pointed reminders of the cruelties committed in the name of the Prince of Peace. There is a later scene in which a woman cannot have a life-saving procedure because “the church” is against cesarean sections. This moment refers to the support given by several Irish Catholic authorities for an even more invasive procedure known as symphysiotomy, which led to lifelong pain and health complications for many women; the authorities argued wrongly that it was both safer for the mother than cesarean sections and more likely to preserve her future fertility. If the film’s only villain were weaponized Catholicism, that would be fair enough. If the film’s only villain were weaponized Catholicism, that would be fair enough. If Doubting Thomas’s atheist-blogger mentality made him the hero, that would be understandable. But “The Devil’s Doorway” is doing something stranger and more haunting, both with the priest’s character and with the role of the church. Even that mention of the Requiem at Terezin may allude to the way some in the camp’s choir understood the Mass as a secret expression of resistance, a warning that the Nazis would soon face their own Dies Irae. Within the Christian faith, however Christians twist it, there is a promise that God hears the cries of victims. There are hints from the beginning of the true nature of the reformatory (why aren’t the girls allowed in the chapel? ), and the exposure of supernatural evil takes “Doubting Thomas” on a desperate journey through the bowels of the reformatory and through his own past—and, at last, his own soul. Once we know for sure that these events have no natural explanation, the film rapidly becomes harrowing: A scene involving a hymn during childbirth is one of the most purely horrifying scenes I have ever watched, and the old priest’s last confession—the film’s most effective borrowing from “The Blair Witch Project”—is unforgettably poignant. Even one of the film’s lapses into cliché has hidden meaning. When Father John exclaims, “Good God!” and his elder replies, “God has nothing to do with this,” it is an exchange found in 99 percent of cheap supernatural horror films. But it is also, arguably, the film’s central question: Is God here? That bleeding statue of the Virgin exposes two truths at once: the truth about what the nuns are doing to the inmates and the truth that someone wants this truth exposed. The final line, “Hush, child,” and the circumstances in which it is spoken, suggest that human efforts have failed. But the found-footage conceit, which damages the film in certain respects, forces the question of how this footage was found at all. Perhaps there has been one more miracle, performed by the one who made the statues bleed, who called the priests to film this evil place—who is always found among the least of these. Toward the end of the film, we see several people receive last rites. In a way this entire film, made by a woman raised Catholic but no longer a believer, is an attempt to give blessing and burial to the real women who died without acknowledgment of their suffering. The article clearly identifies the film as exposing a disgraceful and evil truth. Whenever you mix religion and government both are corrupted.